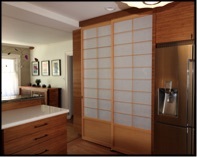 Shoji screens are light-weight translucent panels, usually covering windows but also can be used as closet doors, room partitions, and hinged standing screens. Due to their light-weight they work best as sliding panels. They are constructed with narrow stiles (vertical frame), fairly large rails (horizontal frame), and either single or double sided grillwork(lattice design) with Japanese Shoji paper attached. I do work with the clients to determine a harmonious balanced grill design. The woods offered are softwoods including red cedar, fir, hemlock, and hardwoods including red and white oak, cherry, walnut, and maple. Different types of Shoji insert material can be used. Traditionally Japanese washi (hand made paper) was used in Shoji, although today more durable machine-made papers and synthetics/laminates have replaced washi. Most of my panels contain machine-made Shoji paper, although other possibilities include colored paper, SynSkin (white-fiberglass), acrylics, plastics, laminates, or custom glass. All panels are finished by hand with clear oil and wax. Unless otherwise specified, all Shoji panels include flush mortised ebony finger pulls from Japan. 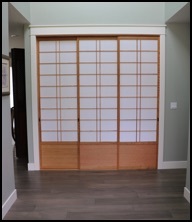 For larger door-size panels, a koshi-ita, or kick-board of solid wood, usually 13" to 16" high from the bottom of the panel, is a practical and aesthetic option. 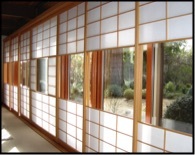 For clients building tea rooms or tatami rooms, I offer a yuki-mi-shoji (snow viewing Shoji) with a vertical moving panel within the Shoji which provides an outside view while one is seated on the tatami floor. I am justifiably proud of my Shoji screens. Meticulous attention to detail and precise craftsmanship go into each panel I build.